Filemaker Inc., a subsidiary of Apple, has released version 12 of their flagship Filemaker Pro database line for Mac(s AAPL), Windows(s MSFT) and iOS. This new version introduces some key enhancements that will make the business software even more appealing to organizations with large databases and those using iOS devices for mobile access to Filemaker solutions. Filemaker Inc. also produces the popular Bento line of personal databases available on the Mac and on iOS, but Filemaker Pro has been a staple in small and medium businesses and workgroups that need to create their own custom database solutions for managing business records and processes. More than 18 million copies of Filemaker Pro have been sold over the years and it is somewhat unique as a bestselling solution from Apple that runs on both Mac and Windows. The big changes in Filemaker Pro 12 come in three parts: design enhancements, improved file and media handling and better support for iOS. The design improvements are meant to bring some of the style and polish seen in Bento templates to Filemaker. I’ve been working professionally with Filemaker since 1994, when I started teaching introductory database classes at University of California, Santa Barbara, and one consistent feature of Filemaker Pro has been that most of the custom solutions that people create for their own use are utilitarian, if not downright ugly. Filemaker Pro 12 introduces 40 new “themes” that can help quickly set background colors, tab and button control colors and font styling to create a more appealing design. There are also 16 redesigned starter solutions that show off the new styles, including layouts tailored for the iPhone and iPad screen. It’s now really easy to add gradients to buttons to improve their look, and the gradients are calculated in software so they look fantastic on Retina-display iOS devices like the iPhone 4/4S and the new iPad. There are five new styles of charts (bubble, scatter, positive/negative, stacked bar and stacked column) and the new guides and rulers help you layout your database with precision. I really like the new “Stencils” that help you design layouts for the iPhone and iPad screens so that you can get the sizing and placement just right. Filemaker Pro 12 now has some great improvements to file management. You can drag and drop to store documents and files in container fields, and Filemaker Server adds the ability to stream videos, music and PDFs. The new feature that I’m most excited about is the automatic file handling, which allows Filemaker Server to organize files stored in the filesystem rather than only being embedded in the database. This means, for example, that a law office could drop a PDF of a court filing onto a container field from the local desktop, and then that file would be saved into a folder on the server, which is also accessible from filesharing over the network. The folder path and the name of the file saved to disk can be determined by rules that automatically save it to a client folder, with subfolders for different types of documents (as set in a field in the database record), and then name the file from the name of the related matter. While the previous paid versions of Filemaker Go were popular, Filemaker Go 12 for iPhone and iPad are now free downloads from the App Store. Making the product free is a big step towards increasing mobile adoption for Filemaker databases. These apps support the new container fields with the ability to directly add files and record audio and video into the database. You can then stream that audio and video content with AirPlay. Using the design enhancements mentioned earlier, it is even easier to create specific layouts that look great on the iPhone and iPad. Along with the new file handling and streaming features that I mentioned earlier, the new Filemaker Server is now 64-bit so it can take advantage of more RAM to improve performance. Wide area network (WAN) performance has been improved, and the backup system now allows for progressive, incremental backups to make it easier to take more frequent snapshots of updates. I spent some time with the new version before press time, and to test it out I built a quick solution for a client that tracks equipment rentals. I was really impressed with the look of the new themes and the ability to quickly create iPhone and iPad layouts with the stencils. I can definitely see the potential in these new tools. Filemaker Pro 12 is available beginning Wednesday. To upgrade will cost $299 or $179 to upgrade, FileMaker Pro 12 Advanced runs $499 or $299 to upgrade, FileMaker Server 12 is $999 or $599 to upgrade, while FileMaker Server 12 Advanced costs $2,999 or $1,799 to upgrade. 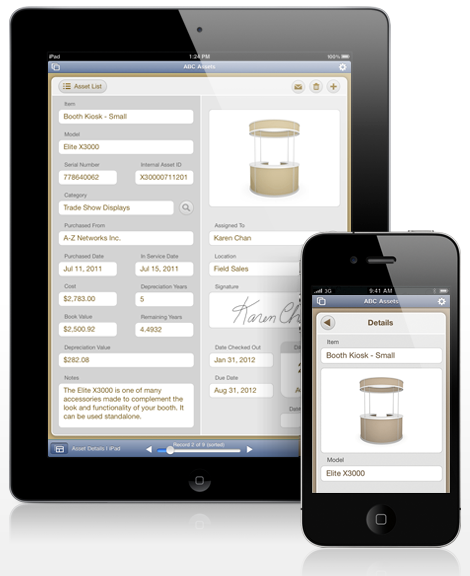 Filemaker Go for iPhone and iPad is available on the iTunes App Store as a free download.